Sweet Tomatoes makes everything up nice and fresh, their Sweet Tomatoes Lemon Greek Penne Pasta is no exception. Whenever you make up a fresh pasta sauce, it just tastes better. I promise once you begin to make your own pasta sauces at home, picking up a jar of the premade stuff, won’t be what comes to mind. You may be asking yourself, what makes this sauce so good? If you like Alfredo sauce, this is a wonderful change. Sometimes during the winter, if you are lucky enough to get a Meyer lemon, I would use one of those lemons if you have them available, but honestly, any fresh lemon will do. Cheesy pasta sauce is a sauce that made me start making Copykat recipes years ago, so my heart always has a special place for a nice creamy pasta sauce. I have a couple of tips for you. Grate your Parmesan cheese fresh if you can, don’t use the stuff in the green jar, and often pre-shredded cheese doesn’t melt quite as well. Special ingredients are added to shredded cheese to keep it separated, and I find my sauce can be lumpy and the cheese won’t always melt if I don’t grate it myself. Do you enjoy Sweet Tomatoes Restaurant Recipes? We have plenty to share with you. Enjoy your favorite copycat salad bar recipes anytime. This recipe is gluten-free if you want a gluten-free meal, use pasta that does not contain gluten. 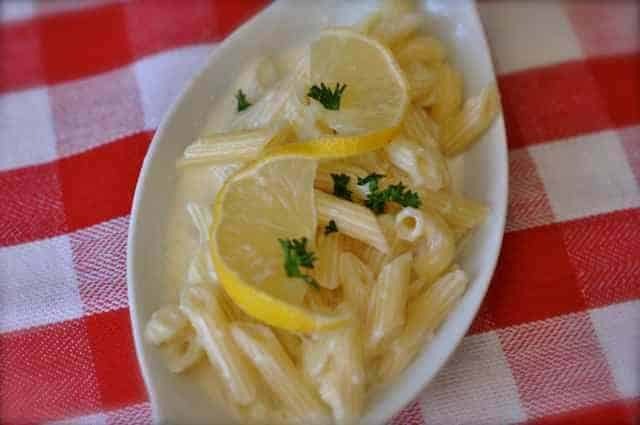 The Sweet Tomatoes Lemon Greek Pasta is a wonderful way to prepare pasta. In a medium-sized saucepan over medium-high heat melt butter, and add heavy cream. When the mixture begins to bubble stir in Parmesan cheese, and stir until well blended, and the cheese has melted. Add in lemon juice and lemon zest and stir. Season with black pepper and salt to taste. In a bowl add cooked pasta and pour sauce over cooked pasta, mix well. You may wish to garnish your pasta dish with some additional Parmesan cheese, parsley, or even a couple of capers. This dish does not re-heat well, so plan on enjoying this dish in one setting. I love to serve this up with some fried chicken cutlets and a glass of white wine. I did a healthier modification to this recipe. Instead of heavy cream, I used almond milk. Instead of butter, I used about a tablespoon of coconut oil. I thickened it with some cornstarch and used the above measurements for the rest. I also added capers.. yum yum. (Just incase anyone wants to make a lighter version) It turned out to be very delicious. Thanks to both for sharing. I will add mixed veggies to the lighter version. I never knew some of these dishes had so much fat in them. No wonder I had a stomach ache afterwards. Let me know how your dish tastes, it sounds like you are going to enjoy a special dinner. I am not sure I understand your question. I made the recipe as close as the one that I tried from them. Now, they have 100s of recipes that they serve. So this was the recipe that I made in response to the one I tried. There wasn’t any pesto in the recipe I tried. I am off to the store to make this recipe for tomorrow and serve with a baked mustard brown sugar ham. It looks delicious.. Thanks for posting.. I hope you enjoy this one. I really liked this pasta sauce.